The Genographic Project, administered by the National Geographic Society, allows you to submit your saliva for DNA extraction, after which they analyze portions of your DNA from your mother or father's side (you must pick, and I picked my father's DNA) to determine your ancestry. The results for me are below. My DNA reveals that I belong to haplogroup R1b, M343 (Subclade R1b1a2, M269), which is shared by most men in southern England, and parts of Spain and Ireland. 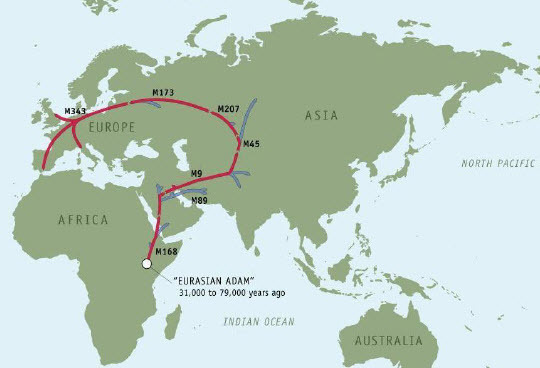 One of my earliest ancestor came out of Northeastern Africa and through the Middle East around 50,000 years ago. Into Iran and Central Asia around 40,000 years ago, my ancestors were then among the first group of humans to populate Europe, in the German region about 30,000 years ago, and I am a direct descendant of the Cro-Magnons. They may have then settled in England, France, Spain, or remained in Germany.